To enjoy full functionality and stability on this website please view in Google Chrome or Firefox, thank you! The Wawona area has continued to weave a spell over visitors ever since, enticing people to stay longer to listen to the babble of the Merced River and breathe the fresh air. 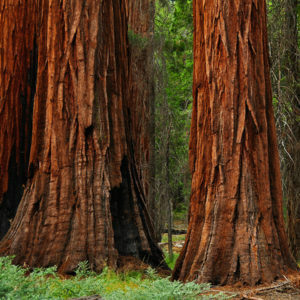 Let your jaw drop at the size and majesty of Mariposa Grove’s celebrated sequoias. Enjoy a horse-drawn carriage ride at the Pioneer Yosemite History Center. Explore the bucolic grounds of the charming Big Trees Lodge (formerly the Wawona Hotel) and play the links at the adjacent golf course. the Big Trees Lodge is a National Historic Landmark, and has been visited by centuries of tourists to Yosemite, including President Theodore Roosevelt. Most of the hotel’s 104 guestrooms open onto the famous verandas, which wrap around the first and second floors; the rooms have open views of the gardened and natural landscapes. The hotel includes six historically distinctive buildings, built between 1876 and 1916. The rooms are furnished with original antiques period pieces, and vintage elements. The hotel has no telephones or televisions in the guestrooms but does feature and excellent dining room serving breakfast, lunch, and dinner. Fun for outdoor enthusiasts and history buffs alike! Horseback ride beneath towering trees or trek the 6.5 miles from the Big Trees Lodge to the Mariposa Grove of Giant Sequoias. In winter, Wawona makes an excellent starting point for snowshoeing and cross country ski adventures. Stop by the Thomas Hill Studio to see original paintings by Thomas Hill, an early pioneer artist who painted Yosemite at the turn of the century and visit the Yosemite Conservancy shop to buy merchandise and books that help support their important work preserving and protecting Yosemite. 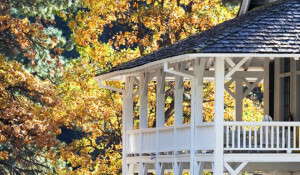 Tour the Pioneer Yosemite History Center, visit the historic studio (now museum and visitor center) of 19th century painter Thomas Hill, or hike to lovely Chilnualna Falls. Options for every group, at every price level. Lodge in comfort and wake up to complimentary breakfast at the Big Trees Lodge. outside the park. During the summer months, rent a privately-owned cabin in the area known as Section 35. Just outside of the park’s south gate, choose from a wide array of lodging options, including inns and campgrounds. Stay at the Tenaya Lodge at Yosemite for luxury and great amenities while staying just 15 minutes drive from Yosemite’s southern entrance. For a family-friendly cabin, stay at The Redwoods, a group of cabins that sleep anywhere from 2-12 and feature kitchens, patios, BBQ’s and more. Directions to Wawona and Southern Yosemite. Wawona lies on Highway 41, midway between the park’s south gate and Yosemite Valley, making it an excellent addition to the trip into or out of the park. Public transportation bus service is available to and from the Big Trees Lodge area via Yosemite Area Regional Transportation System: YARTS Schedule. No shuttle service is available at Big Trees Lodge. Visit our Resources page to find tips on when to go, entrance gate information, and mileage charts. Plan your route with our interactive map to include the best roadside attractions, lodging, dining, and more! Travel information, deals, & more!